Daniels Landscape craned in this giant palm tree in La Jolla, CA. The tree is surrounded by a natural stone planter wall and a brick pedestrian pathway to complement the style of this Italian Villa. We laid these natural pavers and planted grass between the stones to create this unique design. 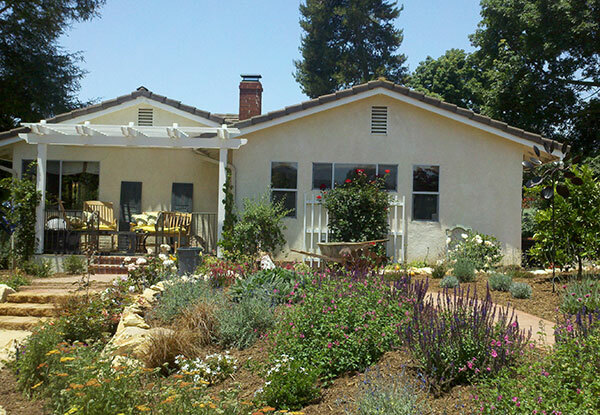 People often compliment the elegant paving system for this Kensington home in the San Diego area. 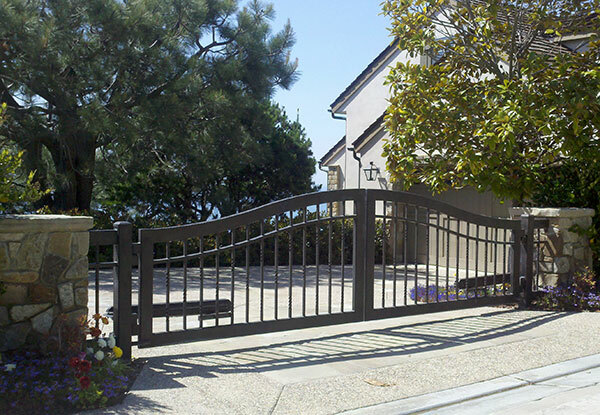 This gated entry system in Bonsall, CA was designed to create a pleasant arrival experience for this residential property. 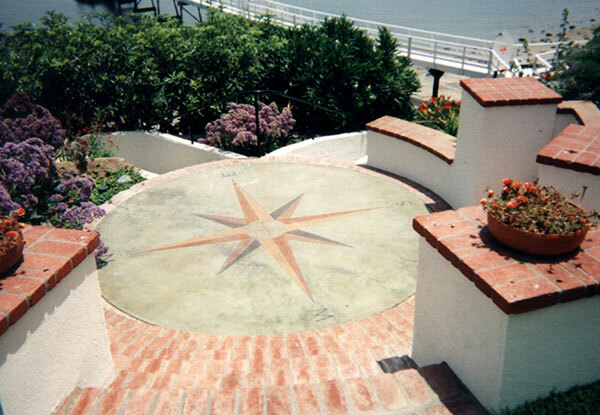 The full circle pathway lined with pavers creates a low maintenance, high-quality entryway. Olive trees produce large amounts of shade and are well-acclimated to Western climates. We used a crane to bring in this large olive tree and planted it in the center of a natural stone planter box for this Carlsbad, CA property. The Giardino all'Italiana or Italian garden is stylistically based on symmetry, axial geometry, and the principle of imposing order over nature. This brick pathway and stone pillars form a grand entryway for this Italian Villa in La Jolla, CA. 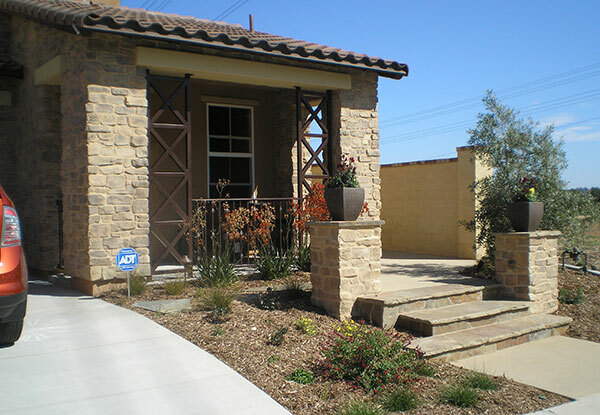 This gated entry system in La Jolla, CA was designed by the landscaping experts at Daniels Landscape. After installing the flagstone pavers and designing the arched entry gate, our client had the gate built and installed by a custom metal fabricator. 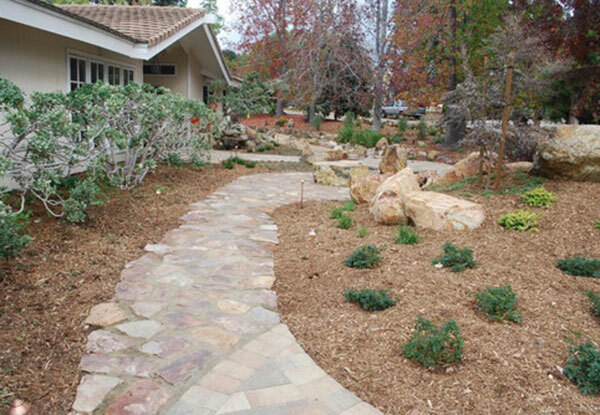 Daniels Landscape installed this natural stone pathway as part of a complete landscaping project in Vista, CA. 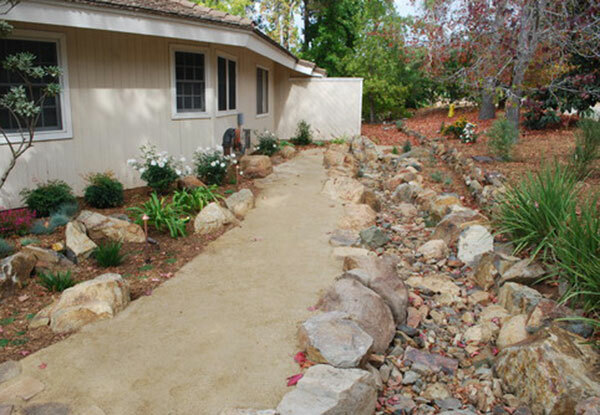 This beautiful walkway complements the home’s unique landscape built using large boulders and other natural rocks. Decomposed granite pathways are a fantastic feature to complement Santa Fe or southwestern styling. 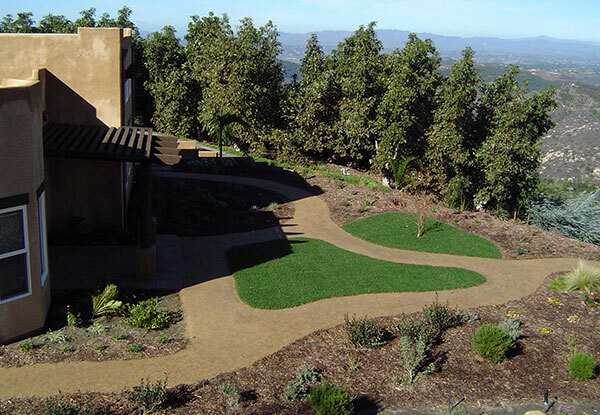 Daniels Landscape installed this decomposed granite pathway in Valley Center, CA. 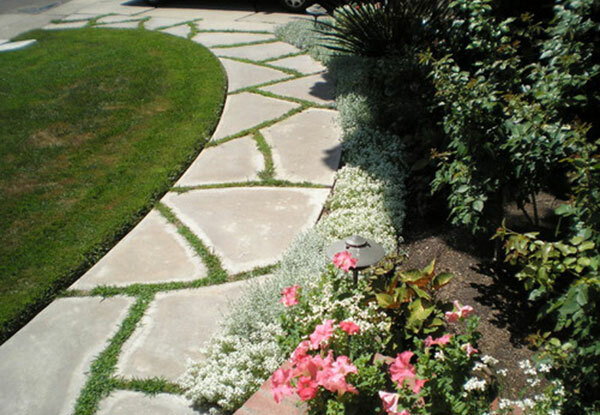 Side yards and entryway can be customized in a variety of ways. 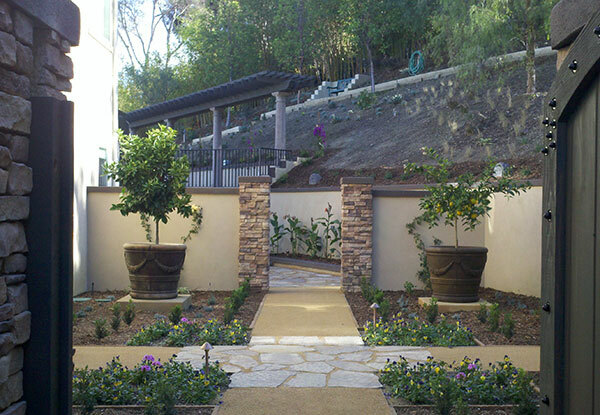 This project features custom gates, large potted trees, and a decomposed granite pathway for a Carlsbad, CA residence. We used 40 tons of boulders to build this custom landscape for a Vista, CA client. After excavating a circular cavity for this gorgeous water feature, we strategically laid boulders and crushed natural rocks to fill in the creek bed creating an elegant and functional appearance. 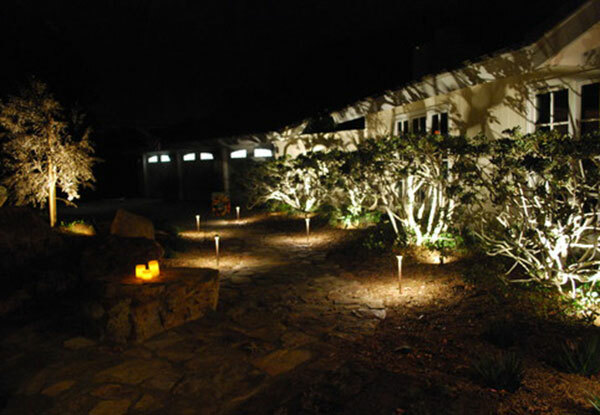 We strategically placed the outdoor LED lights in this Vista, CA homefront to build a dramatic effect on specific elements of the landscape at night. Path lights, spotlights, and down lights are not very noticeable during the day but give this property stand out features at night. 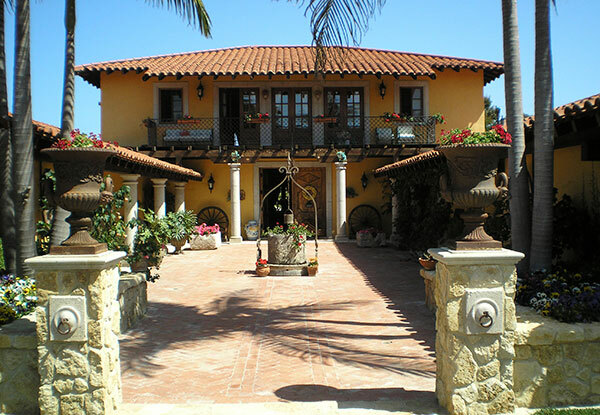 This project included all the masonry work in Point Loma, CA performed on a historic home to help set it apart as a specially preserved establishment. 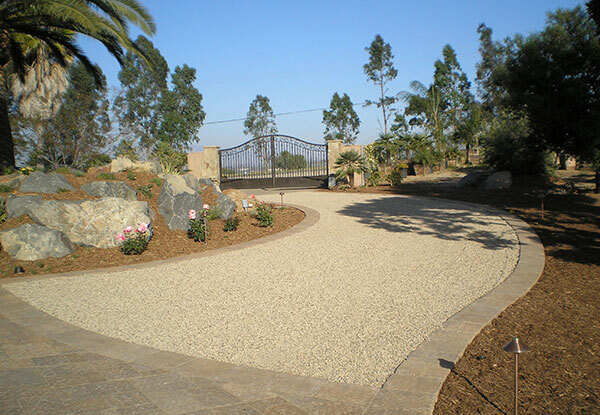 This custom concrete driveway in Carlsbad, CA was designed and installed by Daniels Landscape. We used stone skin imprints, lacquer, and grouted joints to form a granite-like appearance. The driveway was designed to mimic an awe-inspiring, Italian residence that the client had visited in the past. We used natural boulders to create a unique landscape for this Vista, CA residence. The boulders were used to build a creek bed and natural stone walls while pavers were used to create a pathway between two bridges that cross the creek bed. We replaced this barren, asphalt entry with an elegant, exposed aggregate paving and a gorgeous plant wall for this La Jolla, CA residence. 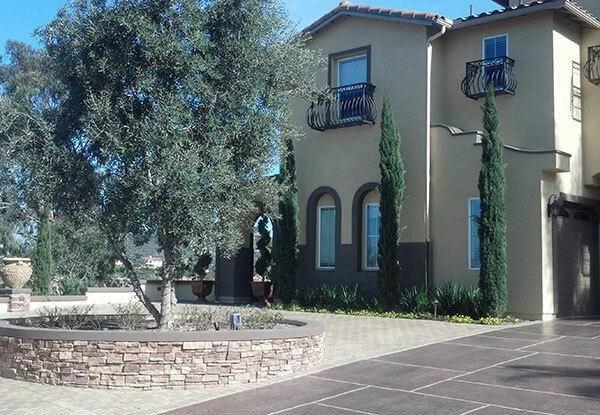 The hardscape and softscape feature work together to complement the style of this Italian Villa. 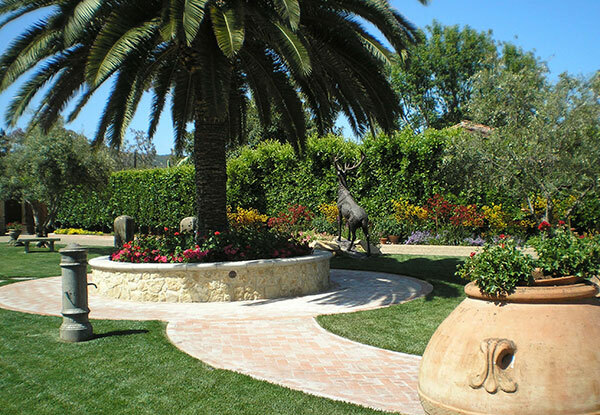 Daniel’s Landscape restructured the backyard of this Italian Villa with stone retaining walls, vibrant potted plants, and hedged stone pathways in La Jolla, CA. 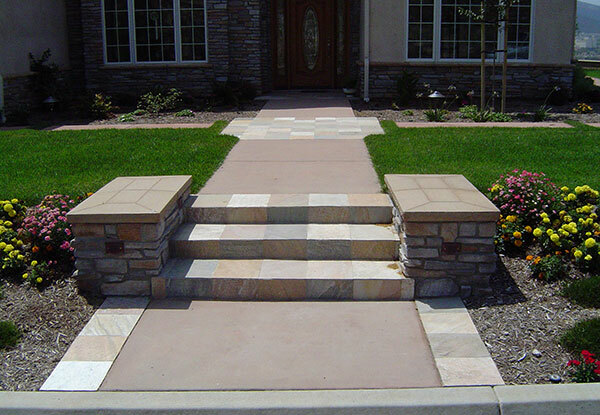 We redesigned this entryway in Carlsbad, CA so the entrance to the side of the home is more apparent with stone accents and built in steps.